Wonderful! Just the right amount of tension. Brian, that should have been at te Nashille show. Nice container. Thanks...I promise to bring trees next year; though you weren't lacking any in talent there! That container is a slab-built one by Byron Myrick. Years ago I commissioned it after an antique Cantonese pot from the book Classic Bonsai of Japan (tree #3). He made three pots; one cracked in the kiln, and this one had the most approximate glaze. I could wish for more green and less gold through the center panel, but he does good work and is always improving. Now that one looks fantastic. Same muscle trunk as another thread yes? It is looking very good now. I love the visual of the trunks through the canopy. This is one of my favorite trees ever! Golf courses are for night fishing! Friend at work loves this tree too! what's up w. the golf tees? Keeps the birdies away...well actually the screen does, tees just keep the screen up off the soil a bit. Hear! Hear! A lot of Hydrilla Gorillas live in golf course ponds! On my way to a place tomorrow where the Smallmouth get 7 pounds. BVF. This has its own thread? Id love to see the progression. I know ive seen it with bigger leaves. You got them down nice. Care to share how? I did a detailed progression over at Bnut, don't have the photos with me to do another one at the moment. Leaf size...they've always been pretty small, but decent ramification and 100% full sun helps. 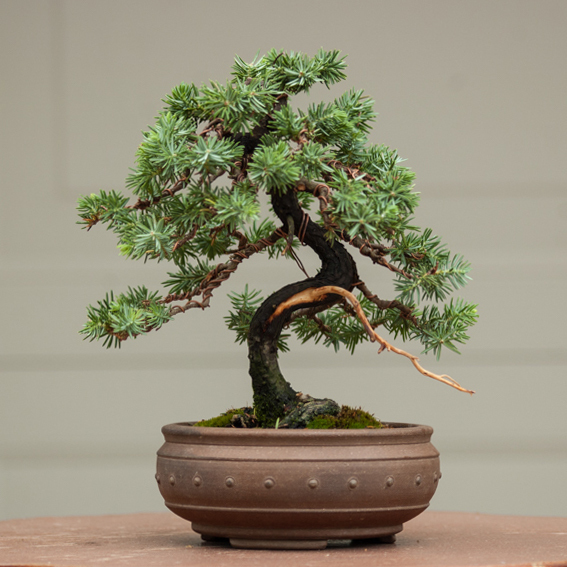 Long time lurker - I plan to create a thread for this shohin common juniper but figured I'd share the results of its first styling.